You won’t need a trolley to explore Muhlenberg Township. Join us on Saturday, September 9th at 10AM at BHC for “Floor Plans” with Country Living writer Michelle Lynch. 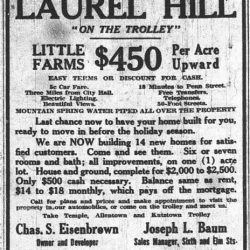 Explore the architecture and history of Muhlenberg Township properties with Country Living writer Michelle Lynch. Muhlenberg Township is the location of this year’s annual 4 Centuries in Berks Historic Property Tour. Get a glimpse of Berks County’s Crossroads! $5.00 members, Gold Card members free, $8.00 non-members. Light Refreshments served at 9:30AM. Program begins at 10AM. Museum admission included in the cost of the program. Off street parking available at 160 Spring Street, Reading.